A medication abortion is a process by which you will take two medications to end and expel a pregnancy. Medication abortions require two separate visits even though the abortion process happens at home, not at the Center. Your first appointment: At your first visit you will read through and fill out paperwork and have an ultrasound to verify the gestation of your pregnancy. You must be within the first 70 days (10 weeks) of the pregnancy. Once it is determined that you are within this time frame, you will have an education session and sign consent forms. After all of your questions have been addressed, the doctor will administer the first of two medications that you will take. The first medication (Mifeprex) causes the pregnancy to stop developing. Within 6 to 72 hours of taking the first medication, you will take the second medication (Misoprostol), which will cause you to expel the pregnancy. Again, this process happens at home, not in the medical office. It can take anywhere from 4 to 12 hours, or longer, for this process to occur. During that time you will have cramping, bleeding, and clotting. Nausea, diarrhea, fever, and chills can also occur. We recommend that you are able to have a 24-hour period with no plans during this process. You must have a support person with you during this time and you must have access to a phone and vehicle and be within 50 miles of a hospital in case of an emergency. 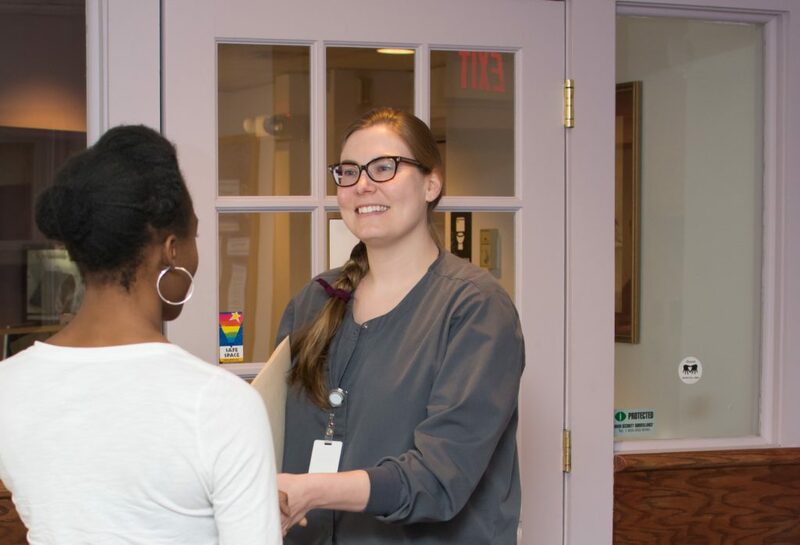 Your follow-up appointment: You will return to Mabel Wadsworth Center within two weeks for your follow-up exam. The medication abortion is 97% effective, and at this appointment we will confirm that the abortion is complete by doing another ultrasound. This appointment usually takes 30 minutes. If you have not passed the pregnancy, you will be given two options: take another dose of Misoprostol or have a suction abortion. If you choose to take the Misoprostol and you still don’t pass the pregnancy, a suction abortion is necessary. What it feels like: Some people compare the experience of a medication abortion to that of having a miscarriage. Most people experience heavy cramps and bleeding within four hours of inserting the Misoprostol. Along with these symptoms, you might also pass blood clots. You might become nauseated or feverish and you might have diarrhea – these are all normal and expected symptoms. The bleeding should slow down within a day, but you can have some bleeding for up to several weeks. You may also have mild cramping for up to 10 days following the abortion process. Time to recover: After an abortion, you will probably have some cramping and bleeding. After inserting the Misoprostol, you should rest for the next 24 hours. Most people will feel back to normal after this time period. It is important not to do any heavy lifting or excessively hard physical work/exercise for a couple days as these things will increase your cramping and bleeding.